Tinactin is a product which aims to relieve burning and itching, as well as cure and prevent the return of athlete’s foot, jock itch and ringworm. It comes in both a powder spray and cream form to provide the best choice for what ails you. Tinactin comes in very bright purple-and-white packaging. The spray is in a can, while the cream is in a tube inside an eye-catching box. I was interested in finding out more about whether or not Tinactin was able to live up to the promises it set out; so I investigated ingredients, cost and guarantee of the product. Wash affected area and dry thoroughly, and then apply a thin layer over affected area twice daily (morning and night). Users should pay special attention to spaces between the toes and wear well-fitting, ventilated shoes and change shoes and socks at least once daily. You should continue to use Tinactin daily for 4 weeks. First, you should wash affected area and dry thoroughly. Shake the Tinactin can well and spray a thin layer over affected area twice daily (morning and night). For athlete’s foot sufferers, they should pay special attention to spaces between the toes; wear well-fitting, ventilated shoes and change shoes and socks at least once daily. Tinactin should be used daily for 4 weeks. For the prevention of athlete’s foot, apply Tinactin once or twice daily (morning and/or night). I was able to find a 3-pack of Tinactin spray on Amazon.com for just $20.35. This is a great price for three 4.6 oz spray cans, at under $7 per can. The 1 oz Tinactin cream retailed on Amazon.com at $10.17 for one tube or $19.94 for two tubes. No, Tinactin has no guarantee on their website; however, they did have a voucher for prospective buyers to use when ordering products online. I was able to find reviews for both types of products on Amazon.com, the Tinactin cream held a 4.5/5 star rating from 16 reviews, which is a great sign for prospective buyers. The Tinactin spray also had a 4.5/5 star review from 44 customers, which is another fantastic sign for buyers. Tinactin claims to be a tough acting product; it seems to be true. Tinactin comes in two different types, a cream and a spray, and can be purchased with ease online. The price is both affordable and also seems to be a great value because both products have exceptional reviews from customers. The active ingredient in Tinactin is tolnaftate 1% which is an anti-fungal proven to work for athlete’s foot sufferers. 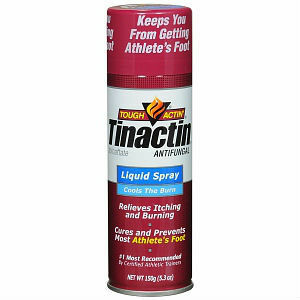 Tinactin seems to be a good choice for those suffering from athlete’s foot, jock itch or ringworm. Jack Stevens	reviewed Tinactin	on January 23rd	 and gave it a rating of 4.